I wanted to end off this week's "food from the earth" theme - head here for any last-minute submissions - with a reminder that ‎even something as seemingly insignificant as a radish can be meaningful in its own way. Bear with me. There's method to my vegetarian madness. The scene: I'm shopping for groceries - at the Great Canadian Superstore, because the Mediocre Canadian Superstore was closed last Sunday - and I'm wandering through the vegetable aisle. I come across the radish bin and stop. For reasons I don't quite understand, I linger over them for a bit. Maybe it's the color. Or perhaps the texture. Then it hits me: I haven't eaten these in a while. I remember my mom used to toss them into salads when I was a kid, but being the silly boy that I was, I didn't fully appreciate the virtues of vegetables, and inevitably tried to drown the poor things in pools of dressing. In retrospect, ew. 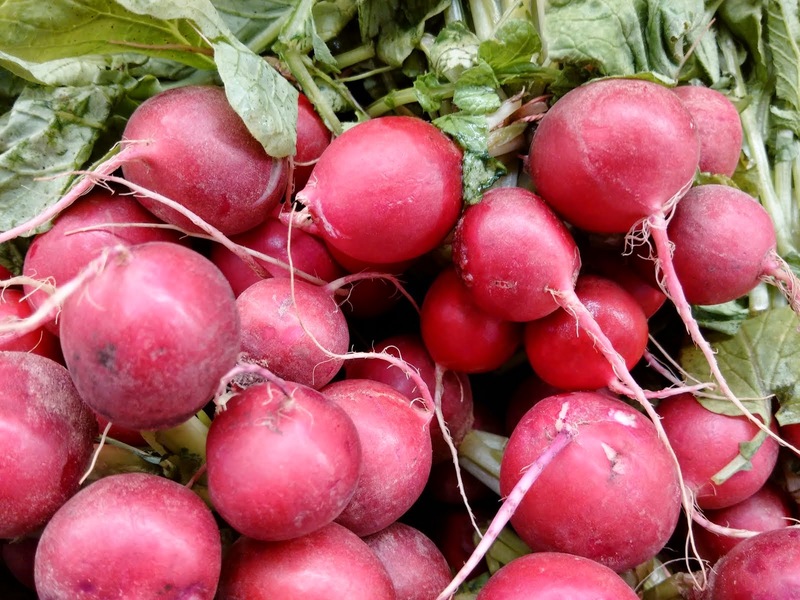 My childhood food issues aside, the radishes always stood out. They had this neat bite to them, an extra zip of taste and an equally sharp texture. If a vegetable went to finishing school, I always surmised it would come out looking like a radish. Which largely explains my little photographic moment all these years later. Because some seeds take a little longer than others to take root. Your turn: ‎Your most/least favorite veggie is...? Why? I hated almost all vegetables as a kid. There are still some veggies that I tend not to eat but I am much more likely to try and even enjoy vegetables these days. That said, I continue to suffer from a gag reflex when I'm around beets. That is a pity, because like you lovely radishes seen above, beets are beautiful. I had radishes in my post, because I had just bought some at Kroger's. They really sharpen up a salad, if you're into such things.